Blood smear from a person with myelodysplastic syndrome. A hypogranular neutrophil with a pseudo-Pelger-Huet nucleus is shown. There are also abnormally shaped red blood cells, in part related to removal of the spleen. Myelodysplastic syndromes (MDS) are a group of cancers in which immature blood cells in the bone marrow do not mature and therefore do not become healthy blood cells. Early on, there are typically no symptoms. Later symptoms may include feeling tired, shortness of breath, easy bleeding, or frequent infections. Some types may develop into acute myeloid leukemia. Risk factors include previous chemotherapy or radiation therapy, exposure to certain chemicals such as tobacco smoke, pesticides, and benzene, and exposure to heavy metals such as mercury or lead. Problems with blood cell formation result in some combination of low red blood cells, low platelets, and low white blood cells. Some types have an increase in immature blood cells, called blasts, in the bone marrow or blood. The types of MDS are based on specific changes in the blood cells and bone marrow. Treatments may include supportive care, drug therapy, and stem cell transplantation. Supportive care may include blood transfusions, medications to increase the making of red blood cells, and antibiotics. Drug therapy may include the medication lenalidomide, antithymocyte globulin, and azacitidine. Certain people can be cured with chemotherapy followed by a stem-cell transplant from a donor. About seven per 100,000 people are affected with about four per 100,000 people newly acquiring the condition each year. The typical age of onset is 70 years. The outlook depends on the type of cells affected, the number of blasts in the bone marrow or blood, and the changes present in the chromosomes of the affected cells. The typical survival time following diagnosis is 2.5 years. The conditions were first recognized in the early 1900s. The current name came into use in 1976. Enlarged spleen due to myelodysplastic syndrome; CT scan coronal section. Spleen in red, left kidney in green. Although some risk exists for developing acute myelogenous leukemia, about 50% of deaths occur as a result of bleeding or infection. However, leukemia that occurs as a result of myelodysplasia is notoriously resistant to treatment. Anemia dominates the early course. Most symptomatic patients complain of the gradual onset of fatigue and weakness, dyspnea, and pallor, but at least half the patients are asymptomatic and their MDS is discovered only incidentally on routine blood counts. Previous chemotherapy or radiation exposure is an important fact in the person's medical history. Fever and weight loss should point to a myeloproliferative rather than myelodysplastic process. Some people have a history of exposure to chemotherapy (especially alkylating agents such as melphalan, cyclophosphamide, busulfan, and chlorambucil) or radiation (therapeutic or accidental), or both (e.g., at the time of stem cell transplantation for another disease). Workers in some industries with heavy exposure to hydrocarbons such as the petroleum industry have a slightly higher risk of contracting the disease than the general population. Xylene and benzene exposure has been associated with myelodysplasia. Vietnam veterans exposed to Agent Orange are at risk of developing MDS. A link may exist between the development of MDS "in atomic-bomb survivors 40 to 60 years after radiation exposure" (in this case, referring to people who were in close proximity to the dropping of the atomic bomb in Hiroshima and Nagasaki during World War II). Children with Down syndrome are susceptible to MDS, and a family history may indicate a hereditary form of sideroblastic anemia or Fanconi anemia. MDS most often develops without an identifiable cause. Risk factors include exposure to an agent known to cause DNA damage, like radiation, benzene, and certain chemotherapies; other risk factors have been inconsistently reported. It can be difficult to prove a connection between a suspected exposure and the development of MDS, but the presence of genetic abnormalities may provide some supportive information. Secondary MDS can occur as a late toxicity of cancer therapy (therapy associated MDS, t-MDS). MDS after exposure to radiation or Alkylating agents such as busulfan, nitrosourea, or procarbazine, typically occurs 3–7 years after exposure and frequently demonstrates loss of chromosome 5 or 7. MDS after exposure to DNA topoisomerase II inhibitors occurs after a shorter latency of only 1–3 years and can have a 11q23 translocation. Other pre-existing bone marrow disorders like acquired aplastic anemia following immunosuppressive treatment and Fanconi anemia can evolve into MDS. MDS is thought to arise from mutations in the multipotent bone marrow stem cell, but the specific defects responsible for these diseases remain poorly understood. Differentiation of blood precursor cells is impaired, and a significant increase in levels of apoptotic cell death occurs in bone marrow cells. Clonal expansion of the abnormal cells results in the production of cells which have lost the ability to differentiate. If the overall percentage of bone marrow myeloblasts rises over a particular cutoff (20% for WHO and 30% for FAB), then transformation to acute myelogenous leukemia (AML) is said to have occurred. The progression of MDS to AML is a good example of the multistep theory of carcinogenesis in which a series of mutations occurs in an initially normal cell and transforms it into a cancer cell. While recognition of leukemic transformation was historically important (see History), a significant proportion of the morbidity and mortality attributable to MDS results not from transformation to AML, but rather from the cytopenias seen in all MDS patients. While anemia is the most common cytopenia in MDS patients, given the ready availability of blood transfusion, MDS patients rarely suffer injury from severe anemia. The two most serious complications in MDS patients resulting from their cytopenias are bleeding (due to lack of platelets) or infection (due to lack of white blood cells). Long-term transfusion of packed red blood cells leads to iron overload. The recognition of epigenetic changes in DNA structure in MDS has explained the success of two (namely the hypomethylating agents 5-azacytidine and decitabine) of three (the third is lenalidomide) commercially available medications approved by the U.S. Food and Drug Administration to treat MDS. Proper DNA methylation is critical in the regulation of proliferation genes, and the loss of DNA methylation control can lead to uncontrolled cell growth and cytopenias. The recently approved DNA methyltransferase inhibitors take advantage of this mechanism by creating a more orderly DNA methylation profile in the hematopoietic stem cell nucleus, and thereby restoring normal blood counts and retarding the progression of MDS to acute leukemia. Some authors have proposed that the loss of mitochondrial function over time leads to the accumulation of DNA mutations in hematopoietic stem cells, and this accounts for the increased incidence of MDS in older patients. Researchers point to the accumulation of mitochondrial iron deposits in the ringed sideroblast as evidence of mitochondrial dysfunction in MDS. Since at least 1974, the deletion in the long arm of chromosome 5 has been known to be associated with dysplastic abnormalities of hematopoietic stem cells. By 2005, lenalidomide, a chemotherapy drug, was recognized to be effective in MDS patients with the 5q- syndrome, and in December 2005, the US FDA approved the drug for this indication. Patients with isolated 5q-, low IPSS risk, and transfusion dependence respond best to lenalidomide. Typically, prognosis for these patients is favorable, with a 63-month median survival. Lenalidomide has dual action, by lowering the malignant clone number in patients with 5q-, and by inducing better differentiation of healthy erythroid cells, as seen in patients without 5q deletion. Mutations in splicing factors have been found in 40-80% of cases with myelodysplastic syndrome, particularly in those with ringed sideroblasts. Mutations in the genes encoding for isocitrate dehydrogenase 1 and 2 (IDH1 and IDH2) occur in 10-20% of patients with myelodysplastic syndrome, and confer a worsened prognosis in low-risk MDS. Because the incidence of IDH1/2 mutations increases as the disease malignancy increases, these findings together suggest that IDH1/2 mutations are important drivers of progression of MDS to a more malignant disease state. GATA2 deficiency is a group of disorders caused by a defect, familial or sporadic inactivating mutations, in one of the two GATA2 genes. These autosomal dominant mutations cause a reduction, in the cellular levels of the gene's product, GATA2. The GATA2 protein is a transcription factor critical for the embryonic development, maintenance, and functionality of blood-forming, lympathic-forming, and other tissue-forming stem cells. In consequence of these mutations, cellular levels of GATA2 are low and individuals develop over time hematological, immunological, lymphatic, or other presentations. Prominent among these presentations is MDS that often progresses to acute myelocytic leukemia or less commonly chronic myelomonocytic leukemia. Transient myeloproliferative disease is the abnormal proliferation of a clone of non-cancerous megakaryoblasts in the liver and bone marrow. The disease is restricted to individuals with Down syndrome or genetic changes similar to those in Down syndrome, develops during pregnancy or shortly after birth, and resolves within 3 months or, in ~10% of cases, progresses to acute megakaryoblastic leukemia. Full blood count and examination of blood film: The blood film morphology can provide clues about hemolytic anemia, clumping of the platelets leading to spurious thrombocytopenia, or leukemia. Blood tests to eliminate other common causes of cytopenias, such as lupus, hepatitis, B12, folate, or other vitamin deficiencies, renal failure or heart failure, HIV, hemolytic anemia, monoclonal gammopathy: Age-appropriate cancer screening should be considered for all anemic patients. Bone marrow examination by a hematopathologist: This is required to establish the diagnosis, since all hematopathologists consider dysplastic marrow the key feature of myelodysplasia. Cytogenetics or chromosomal studies: This is ideally performed on the bone marrow aspirate. Conventional cytogenetics require a fresh specimen, since live cells are induced to enter metaphase to allow chromosomes to be seen. Interphase fluorescence in situ hybridization testing, usually ordered together with conventional cytogenetic testing, offers rapid detection of several chromosome abnormalities associated with MDS, including del 5q, -7, +8, and del 20q. Virtual karyotyping can be done for MDS, which uses computational tools to construct the karyogram from disrupted DNA. Virtual karyotyping does not require cell culture and has dramatically higher resolution than conventional cytogenetics, but cannot detect balanced translocations. Flow cytometry is helpful to identify blasts, abnormal myeloid maturation, and establish the presence of any lymphoproliferative disorder in the marrow. Testing for copper deficiency should not be overlooked, as it can morphologically resemble MDS in bone marrow biopsies. The features generally used to define a MDS are blood cytopenias, ineffective hematopoiesis, dyserythropoiesis, dysgranulopoiesis, dysmegakaropoiesis, and increased myeloblasts. Loss of e-cadherin in normoblasts is a sign of aberrancy. Other stains can help in special cases (PAS and napthol ASD chloroacetate esterase positivity) in eosinophils is a marker of abnormality seen in chronic eosinophilic leukemia and is a sign of aberrancy. On the bone marrow biopsy, high-grade dysplasia (RAEB-I and RAEB-II) may show atypical localization of immature precursors which are islands of immature precursors cells (myeloblasts and promyelocytes) localized to the center of the intertrabecular space rather than adjacent to the trabeculae or surrounding arterioles. This morphology can be difficult to differentiate from treated leukemia and recovering immature normal marrow elements. Also topographic alteration of the nucleated erythroid cells can be seen in early myelodysplasia (RA and RARS), where normoblasts are seen next to bony trabeculae instead of forming normal interstitially placed erythroid islands. Myelodysplasia is a diagnosis of exclusion and must be made after proper determination of iron stores, vitamin deficiencies, and nutrient deficiencies are ruled out. Also, congenital diseases such as congenital dyserythropoietic anemia (CDA I through IV) have been recognized, Pearson's syndrome (sideroblastic anemia), Jordans anomaly - vacuolization in all cell lines may be seen in Chanarin-Dorfman syndrome, aminolevulinic acid enzyme deficiency, and other more esoteric enzyme deficiencies are known to give a pseudomyelodysplastic picture in one of the cell lines; however, all three cell lines are never morphologically dysplastic in these entities with the exception of chloramphenicol, arsenic toxicity, and other poisons. All of these conditions are characterized by abnormalities in the production of one or more of the cellular components of blood (red cells, white cells other than lymphocytes, and platelets or their progenitor cells, megakaryocytes). 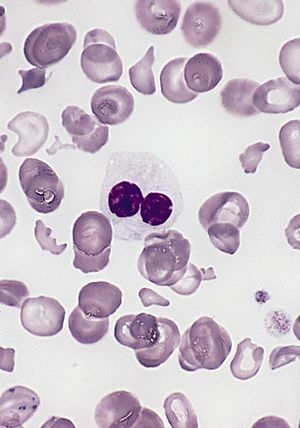 M9982/3 Refractory anemia with ring sideroblasts (RARS) also characterized by less than 5% myeloblasts in the bone marrow, but distinguished by the presence of 15% or greater of red cell precursors in the marrow being abnormal iron-stuffed cells called "ringed sideroblasts"
M9945/3 Chronic myelomonocytic leukemia (CMML), not to be confused with chronic myelogenous leukemia or CML characterized by less than 20% myeloblasts in the bone marrow and greater than 1*109/L monocytes (a type of white blood cell) circulating in the peripheral blood. The best prognosis is seen with RA and RARS, where some nontransplant patients live more than a decade (the average is on the order of three to five years, although long-term remission is possible if a bone marrow transplant is successful). The worst outlook is with RAEB-T, where the mean life expectancy is less than 1 year. About one-quarter of patients develop overt leukemia. The others die of complications of low blood count or unrelated disease. The International Prognostic Scoring System is another tool for determining the prognosis of MDS, published in Blood in 1997. This system takes into account the percentage of blasts in the marrow, cytogenetics, and number of cytopenias. In the late 1990s, a group of pathologists and clinicians working under the World Health Organization (WHO) modified this classification, introducing several new disease categories and eliminating others. Most recently, the WHO has evolved a new classification scheme (2008) which is based more on genetic findings. However, morphology of the cells in the peripheral blood, bone marrow aspirate, and bone marrow biopsy are still the screening tests used to decide which classification is best and which cytogenetic aberrations may be related. Refractory cytopenia with multilineage dysplasia (RCMD) includes the subset Refractory cytopenia with multilineage dysplasia and ring sideroblasts (RCMD-RS). RCMD includes patients with pathological changes not restricted to red cells (i.e., prominent white cell precursor and platelet precursor (megakaryocyte) dysplasia. Refractory anemia with excess blasts (RAEB) Refractory anemias with excess blasts I and II. RAEB was divided into RAEB-I (5-9% blasts) and RAEB-II (10-19%) blasts, which has a poorer prognosis than RAEB-I. Auer rods may be seen in RAEB-II which may be difficult to distinguish from acute myeloid leukemia. Refractory anemia with excess blasts in transformation (RAEB-T) This category was eliminated; such patients are now considered to have acute leukemia. 5q- syndrome, typically seen in older women with normal or high platelet counts and isolated deletions of the long arm of chromosome 5 in bone marrow cells, was added to the classification. Chronic myelomonocytic leukemia (CMML) CMML was removed from the myelodysplastic syndromes and put in a new category of myelodysplastic-myeloproliferative overlap syndromes. Note : not all physicians concur with this reclassification, because the underlying pathology of this diseases is not well understood. Rare cases with less than 5% blast will present with Auer rods. These cases usually have the features of RAMD. Occasionally, cases of MDS present with isolated neutropenia or thrombocytopenia without anemia and with dysplastic changes confined to the single lineage. The term refractory neutropenia and refractory thrombocytopenia have sometimes been used to describe these cases. A diagnosis of MDS in patients with neutropenia or thrombocytopenia without anemia should be made with caution. Patients with RA or RAEB occasionally present with leukocytosis or thrombocytosis instead of the usual cytopenia. The goals of therapy are to control symptoms, improve quality of life, improve overall survival, and decrease progression to AML. The IPSS scoring system can help triage patients for more aggressive treatment (i.e. bone marrow transplant) as well as help determine the best timing of this therapy. Supportive care with blood products and hematopoietic growth factors (e.g. erythropoietin) is the mainstay of therapy. The regulatory environment for the use of erythropoietins is evolving, according to a recent US Medicare National coverage determination. However, no comment on the use of hematopoeitic growth factors for MDS was made in that document. Decitabine: Complete response rate reported as high as 43%. A phase I study has shown efficacy in AML when decitabine is combined with valproic acid. Chemotherapy with the hypomethylating agents 5-azacytidine and decitabine has been shown to decrease blood transfusion requirements and to retard the progression of MDS to AML. Lenalidomide was approved by the FDA in December 2005 only for use in the 5q- syndrome. In the United States, treatment of MDS with lenalidomide costs about $9,200 per month. HLA-matched allogeneic stem cell transplantation, particularly in younger (i.e. less than 40 years of age) and more severely affected patients, offers the potential for curative therapy. Success of bone marrow transplantation has been found to correlate with severity of MDS as determined by the IPSS score, with patients having a more favorable IPSS score tending to have a more favorable outcome with transplantation. Iron overload can develop in MDS as a result of the RBC transfusions which are a major part of the supportive care for anemic MDS patients. There is a particular risk of delayed engraftment and a need for repeated red-cell transfusion following HLA-identical allogeneic stem-cell transplantation if the recipient is blood type O and the stem-cell donor, type A. Although the specific therapies patients receive may alleviate the RBC transfusion need in some cases, many MDS patients may not respond to these treatments and thus may develop secondary hemochromatosis due to iron overload from repeated RBC transfusions. Patients requiring relatively large numbers of RBC transfusions can experience the adverse effect of chronic iron overload on their liver, heart, and endocrine functions. The resulting organ dysfunction from transfusional iron overload might be a contributor to increased illness and death in early-stage MDS. For patients requiring many RBC transfusions, serum ferritin levels, number of RBC transfusions received, and associated organ dysfunction (heart, liver, and pancreas) should be monitored to determine iron levels. Monitoring serum ferritin may also be useful, aiming to decrease ferritin levels to < 1000 µg/l. Currently, two iron chelators are available in the US, deferoxamine for intravenous use and deferasirox for oral use. These options now provide potentially useful drugs for treating this iron overload problem. A third chelating agent is available in Europe, deferiprone for oral use, but not available in the US. Clinical trials in the MDS are ongoing with iron chelating agents to address the question of whether iron chelation alters the natural history of patients with MDS who are transfusion dependent. Reversal of some of the consequences of iron overload in MDS by iron chelation therapy have been shown. Both the MDS Foundation and the National Comprehensive Cancer Network MDS Guidelines Panel have recommended that chelation therapy be considered to decrease iron overload in selected MDS patients. Evidence also suggests a potential value exists to iron chelation in patients who will undergo a stem cell transplant. Although deferasirox is generally well tolerated (other than episodes of gastrointestinal distress and kidney dysfunction in some patients), recently a safety warning by the FDA and Novartis was added to deferasirox treatment guidelines. Following postmarketing use of deferasirox, rare cases of acute kidney failure or liver failure occurred, some resulting in death. Due to this, patients should be closely monitored on deferasirox therapy prior to the start of therapy and regularly thereafter. The outlook in MDS is variable, with about 30% of patients progressing to refractory AML. The median survival time varies from years to months, depending on type. Stem-cell transplantation offers possible cure, with survival rates of 50% at 3 years, although older patients do poorly. The IPSS is the most commonly used tool in MDS to predict long-term outcome. Cytogenetic abnormalities can be detected by conventional cytogenetics, a FISH panel for MDS, or virtual karyotype. Although not yet formally incorporated in the generally accepted classification systems, molecular profiling of myelodysplastic syndrome genomes has increased the understanding of prognostic molecular factors for this disease. For example, in low-risk MDS, IDH1 and IDH2 mutations are associated with significantly worsened survival. The exact number of people with MDS is not known because it can go undiagnosed and no tracking of the syndrome is mandated. Some estimates are on the order of 10,000 to 20,000 new cases each year in the United States alone. The number of new cases each year is probably increasing as the age of the population increases, and some authors propose that the number of new cases in those over 70 may be as high as 15 per 100,000 per year. The typical age at diagnosis of MDS is between 60 and 75 years; a few people are younger than 50, and diagnoses are rare in children. Males are slightly more commonly affected than females. Since the early 20th century, some people with acute myelogenous leukemia were begun to be recognized to have a preceding period of anemia and abnormal blood cell production. These conditions were lumped together with other diseases under the term "refractory anemia". The first description of "preleukemia" as a specific entity was published in 1953 by Block et al. The early identification, characterization and classification of this disorder were problematical, and the syndrome went by many names until the 1976 FAB classification was published and popularized the term MDS. ^ "Myelodysplasia". SEER. Archived from the original on 27 October 2016. Retrieved 27 October 2016. ^ a b c d e f g h i j k l m n o p q r s "Myelodysplastic Syndromes Treatment (PDQ®)–Patient Version". NCI. 12 August 2015. Archived from the original on 5 October 2016. Retrieved 27 October 2016. ^ a b c d Germing, U; Kobbe, G; Haas, R; Gattermann, N (15 November 2013). "Myelodysplastic syndromes: diagnosis, prognosis, and treatment". Deutsches Arzteblatt International. 110 (46): 783–90. doi:10.3238/arztebl.2013.0783. PMC 3855821. PMID 24300826. ^ a b Hong, Waun Ki; Holland, James F. (2010). Holland-Frei Cancer Medicine 8 (8 ed.). PMPH-USA. p. 1544. ISBN 9781607950141. Archived from the original on 2016-10-27. ^ Myelodysplastic Syndrome. The Leukemia & Lymphoma Society. White Plains, NY. 2001. p 24. Retrieved 05-12-2008. ^ Cazzola M, Invernizzi R, Bergamaschi G, et al. (2003). "Mitochondrial ferritin expression in erythroid cells from patients with sideroblastic anemia". Blood. 101 (5): 1996–2000. doi:10.1182/blood-2002-07-2006. PMID 12406866. ^ Bunn HF (1986). "5q- and disordered haematopoiesis". Clinics in Haematology. 15 (4): 1023–35. PMID 3552346. ^ Van den Berghe H, Cassiman JJ, David G, Fryns JP, Michaux JL, Sokal G (1974). "Distinct haematological disorder with deletion of long arm of no. 5 chromosome". Nature. 251 (5474): 437–8. doi:10.1038/251437a0. PMID 4421285. ^ List A, Kurtin S, Roe DJ, et al. (2005). "Efficacy of lenalidomide in myelodysplastic syndromes". N. Engl. J. Med. 352 (6): 549–57. doi:10.1056/NEJMoa041668. PMID 15703420. ^ Molenaar, Remco J.; Radivoyevitch, Tomas; Maciejewski, Jaroslaw P.; van Noorden, Cornelis J. F.; Bleeker, Fonnet E. (2014-12-01). "The driver and passenger effects of isocitrate dehydrogenase 1 and 2 mutations in oncogenesis and survival prolongation". Biochimica et Biophysica Acta (BBA) - Reviews on Cancer. 1846 (2): 326–341. doi:10.1016/j.bbcan.2014.05.004. PMID 24880135. ^ a b c Molenaar, R J; Thota, S; Nagata, Y; Patel, B; Clemente, M; Przychodzen, B; Hirsh, C; Viny, A D; Hosano, N (2015). "Clinical and biological implications of ancestral and non-ancestral IDH1 and IDH2 mutations in myeloid neoplasms". Leukemia. 29 (11): 2134–2142. doi:10.1038/leu.2015.91. PMC 5821256. PMID 25836588. ^ a b Crispino JD, Horwitz MS (April 2017). "GATA factor mutations in hematologic disease" (PDF). Blood. 129 (15): 2103–2110. doi:10.1182/blood-2016-09-687889. PMC 5391620. PMID 28179280. ^ Hirabayashi S, Wlodarski MW, Kozyra E, Niemeyer CM (August 2017). "Heterogeneity of GATA2-related myeloid neoplasms". International Journal of Hematology. 106 (2): 175–182. doi:10.1007/s12185-017-2285-2. PMID 28643018. ^ Gondek LP, Tiu R, O'Keefe CL, Sekeres MA, Theil KS, Maciejewski JP. Chromosomal lesions and uniparental disomy detected by SNP arrays in MDS, MDS/MPD, and MDS-derived AML. Blood. 2008 Feb 1;111(3):1534-42. ^ Huff, Jason D; Keung, Yi-Kong; Thakuri, Mohan; Beaty, Micheal W; Hurd, David D; Owen, John; Molnár, István (2007). "Copper deficiency causes reversible myelodysplasia". American Journal of Hematology. 82 (7): 625–630. doi:10.1002/ajh.20864. PMID 17236184. ^ Bennett JM, Catovsky D, Daniel MT, et al. (August 1976). "Proposals for the classification of the acute leukaemias. French-American-British (FAB) co-operative group". Br. J. Haematol. 33 (4): 451–8. doi:10.1111/j.1365-2141.1976.tb03563.x. PMID 188440. ^ "Table 1: French-American-British (FAB) Classification of MDS". Archived from the original on 2006-01-17. ^ Greenberg P, Cox C, LeBeau MM, Fenaux P, Morel P, Sanz G, Sanz M, Vallespi T, Hamblin T, Oscier D, Ohyashiki K, Toyama K, Aul C, Mufti G, Bennett J (1997). "International scoring system for evaluating prognosis in myelodysplastic syndromes". Blood. 89 (6): 2079–88. PMID 9058730. ^ Cutler CS, Lee SJ, Greenberg P, Deeg HJ, Perez WS, Anasetti C, Bolwell BJ, Cairo MS, Gale RP, Klein JP, Lazarus HM, Liesveld JL, McCarthy PL, Milone GA, Rizzo JD, Schultz KR, Trigg ME, Keating A, Weisdorf DJ, Antin JH, Horowitz MM (2004). "A decision analysis of allogeneic bone marrow transplantation for the myelodysplastic syndromes: delayed transplantation for low-risk myelodysplasia is associated with improved outcome". Blood. 104 (2): 579–85. doi:10.1182/blood-2004-01-0338. PMID 15039286. ^ "Centers for Medicare & Medicaid Services". Archived from the original on 2008-10-05. Retrieved 2007-10-29. ^ Wijermans P, Lübbert M, Verhoef G, et al. (2000). "Low-dose 5-aza-2'-deoxycytidine, a DNA hypomethylating agent, for the treatment of high-risk myelodysplastic syndrome: a multicenter phase II study in elderly patients". J. Clin. Oncol. 18 (5): 956–62. doi:10.1200/JCO.2000.18.5.956. PMID 10694544. ^ Lübbert M, Wijermans P, Kunzmann R, et al. (2001). "Cytogenetic responses in high-risk myelodysplastic syndrome following low-dose treatment with the DNA methylation inhibitor 5-aza-2'-deoxycytidine". Br. J. Haematol. 114 (2): 349–57. doi:10.1046/j.1365-2141.2001.02933.x. PMID 11529854. ^ Silverman LR, Demakos EP, Peterson BL, et al. (2002). "Randomized controlled trial of azacitidine in patients with the myelodysplastic syndrome: a study of the cancer and leukemia group B". J. Clin. Oncol. 20 (10): 2429–40. doi:10.1200/JCO.2002.04.117. PMID 12011120. ^ Silverman LR, McKenzie DR, Peterson BL, et al. (2006). "Further analysis of trials with azacitidine in patients with myelodysplastic syndrome: studies 8421, 8921, and 9221 by the Cancer and Leukemia Group B". J. Clin. Oncol. 24 (24): 3895–903. doi:10.1200/JCO.2005.05.4346. PMID 16921040. ^ Kantarjian HM, O'Brien S, Shan J, et al. (2007). "Update of the decitabine experience in higher risk myelodysplastic syndrome and analysis of prognostic factors associated with outcome". Cancer. 109 (2): 265–73. doi:10.1002/cncr.22376. PMID 17133405. ^ Kantarjian H, Issa JP, Rosenfeld CS, et al. (2006). "Decitabine improves patient outcomes in myelodysplastic syndromes: results of a phase III randomized study". Cancer. 106 (8): 1794–803. doi:10.1002/cncr.21792. PMID 16532500. ^ Kantarjian H, Oki Y, Garcia-Manero G, et al. (2007). "Results of a randomized study of 3 schedules of low-dose decitabine in higher-risk myelodysplastic syndrome and chronic myelomonocytic leukemia". Blood. 109 (1): 52–7. doi:10.1182/blood-2006-05-021162. PMID 16882708. ^ Blum W, Klisovic RB, Hackanson B, et al. (2007). "Phase I study of decitabine alone or in combination with valproic acid in acute myeloid leukemia". J. Clin. Oncol. 25 (25): 3884–91. doi:10.1200/JCO.2006.09.4169. PMID 17679729. ^ List A, Dewald G, Bennett J, et al. (2006). "Lenalidomide in the myelodysplastic syndrome with chromosome 5q deletion". N. Engl. J. Med. 355 (14): 1456–65. doi:10.1056/NEJMoa061292. PMID 17021321. ^ "Lenalidomide (Revlimid) for anemia of myelodysplastic syndrome". The Medical Letter on Drugs and Therapeutics. 48 (1232): 31–2. 2006. PMID 16625140. ^ Oosterveld M, Wittebol S, Lemmens W, Kiemeney B, Catik A, Muus P, Schattenberg A, de Witte T (2003). "The impact of intensive antileukaemic treatment strategies on prognosis of myelodysplastic syndrome patients aged less than 61 years according to International Prognostic Scoring System risk groups". Br J Haematol. 123 (1): 81–9. doi:10.1046/j.1365-2141.2003.04544.x. PMID 14510946. ^ Tefferi, Ayalew; Vardiman, James W. (5 November 2009). "Myelodysplastic Syndromes". New England Journal of Medicine. 361 (19): 1872–1885. doi:10.1056/NEJMra0902908. PMID 19890130. ^ Kasper, Dennis L; Braunwald, Eugene; Fauci, Anthony; et al. (2005). Harrison's Principles of Internal Medicine (16th ed.). New York: McGraw-Hill. p. 625. ISBN 978-0-07-139140-5. ^ Solé E, et al. (2000). "Incidence, characterization and prognostic significance of chromosomal abnormalities in 640 patients with primary myelodysplastic syndromes". British Journal of Haematology. 108 (2): 346–356. doi:10.1046/j.1365-2141.2000.01868.x. PMID 10691865. ^ Greenberg; et al. (1997). "International Scoring System for Evaluating Prognosis in Myelodysplastic Syndromes". Blood. 89: 2079–2088. ^ Aul C, Giagounidis A, Germing U (2001). "Epidemiological features of myelodysplastic syndromes: results from regional cancer surveys and hospital-based statistics". Int. J. Hematol. 73 (4): 405–10. doi:10.1007/BF02994001. PMID 11503953. ^ Block M, Jacobson LO, Bethard WF (July 1953). "Preleukemic acute human leukemia". J Am Med Assoc. 152 (11): 1018–28. doi:10.1001/jama.1953.03690110032010. PMID 13052490. ^ "Remembering Carl Sagan - Universe Today". Universe Today. 9 November 2012. Archived from the original on 12 March 2017. Retrieved 10 March 2017. ^ "Illness as More Than Metaphor". The New York Times. 4 December 2005. Retrieved 18 December 2017. ^ "Saxophonist Brecker dies from MDS". Variety. 14 January 2007. Retrieved 23 September 2018. Wikimedia Commons has media related to Myelodysplastic syndrome. Fenaux, P., et al. (2014). Myelodysplastic syndromes: ESMO Clinical Practice Guidelines for diagnosis, treatment and follow-up. Annals of Oncology 25(suppl 3): iii57-iii69. This page was last edited on 16 April 2019, at 19:59 (UTC).